Yes, there's a new bag in town! It's quite big at 15.5" wide, 12" tall and 3.5" deep. Large and sturdy enough to carry books, a laptop and more. Three layers of interface, two fusible and one thick layer of ultra firm peltex, give the bag lots of structure and durability. Three interior pockets and a pen slip keep things organized. 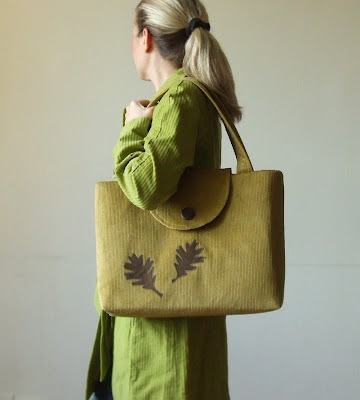 It's made from honey yellow corduroy and adorned by two oak leaf appliques. Just perfect for the upcoming fall season! I'll be adding it to my shop along with a couple of more new handbags later this afternoon. 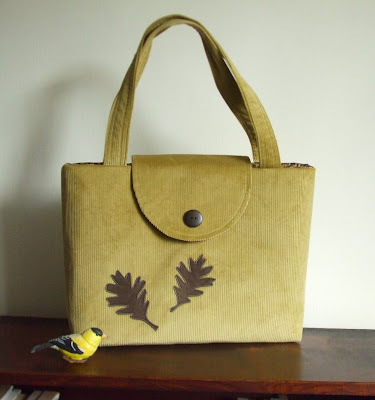 A great bag, in more than one sense! I love big and boxy type bags! 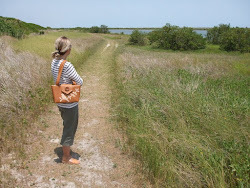 They can easily take on the role of purse and diaper bag! I refuse to carry two bags around...so, this is just the kind of bag I look for...with dividers and pockets. Fantastic! I love oversize bags. And who might the model be? I like the new bag. Very nice. 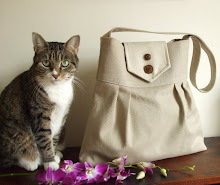 I've seen your bags on Etsy's front page before. You do such beautiful work. Love your new bag.